Everyone always said the house was haunted. Rising from the curb across the street, she tossed away the cigarette and strode right up to the Creole mansion, its pillars supporting growth and bloom like huge tomato cages. Vines encompassing the front porch pillars urged them inwards, creating a screen of blossoms. With hands in front of her she parted these, judged the distance between rotted boards, and stepped across. The front door had been stolen. The wide floorboards inside were solid. She strode determinedly forward, her body deliberate in its motion, her mind unfocused as to intention. The woman was impelled by the feverish impulse to be somewhere besides in her own life. She had left the house mid-morning, finally alone. On the landing she stopped. All the doors were ajar. Old sunshine outlining leaves filigreed the walls of the hallway. Her own shuffling feet stirred flights of antique bug lint, tiny particles of an ancient epoch’s detritus…. Before she could react with surprise, she had accepted. She did not turn her head to look, but closed her eyes. It seemed fitting, the caress along her neck. A warm hand encircled her ankle—then let go! A supporting current of air ruffled her skirt, then wreathed her waist. At once she felt lighter, elated. For a long minute she couldn’t move; she didn’t want to…why go anywhere else? So, she waited, wholly supported by this current of uplifting calm. The nurturing atmosphere, nascent of change, next bore on the air an inchoate Sound…. notes floated. A thin tune seemed to invite her. –Now more firmly embraced, she became dizzy, started to feel sick. Then, befitting her surrounds –she fainted. As she lay on the floor in a room she had never seen, a breath on her ear awoke her, then withdrew. faint, familiar melody, soothing and languorous. *She did not return to her life as it had been before entering the house. For a long time she did not return to her family. When she did she was different. **She never was herself again after that time in the house. She left America, and found great success working with dolphins at a small resort zoo in the islands. She became more beautiful and found happiness — albeit lapsing from time to time into somewhat risqué` behaviors. ***In due time she was delivered of twins: pale, unearthly, neither of whom would ever speak a word. ****She found work she liked, as librarian for a cruise line. She sailed, after that, in and out of ports all over the world. At night she slept in her own little bunk beside the stacks, tucked near the center of the hold. from that day things had never been the same! This past year 86 Danes came into rescue. The economy is still the biggest factor on them being given up. 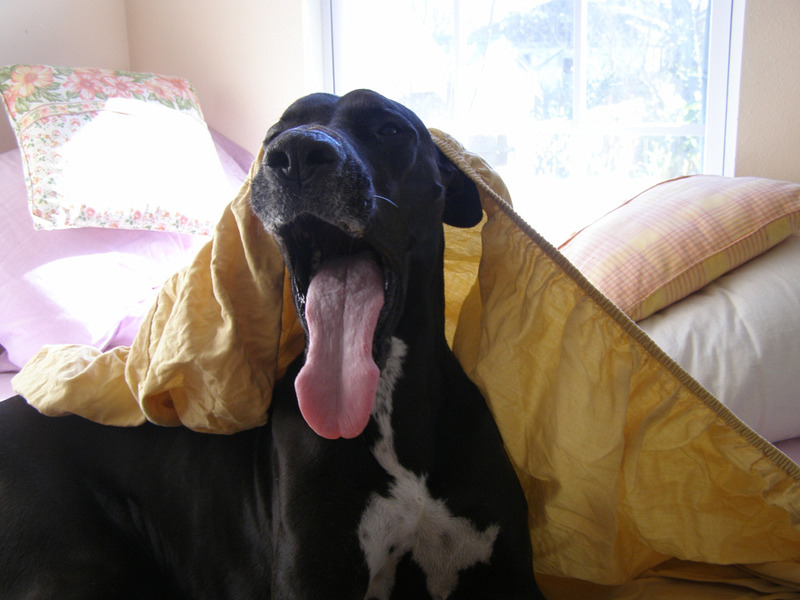 It is hard to relocate if you have a large dog and it is hard to feed a Dane if you lose your job. Hopefully 2010 will bring better times to our area. Please call Sue Sexton or Jules Fairfax if you think you could offer love to a Dane. These dogs come to you fixed and trained and healthy. We couldn’t have said it better ourselves. But perhaps the change this community needs is a little more park and a little less golf course in City Park. In August of 2005, Katrina’s floodwaters shut down the golf courses in City Park that had claimed more than half of the available land in the park for generations. Yet the disaster had an unexpected silver lining: areas of the park to which the non-golfing public had been denied access since the 1950’s were discovered, welcomed, and enjoyed. Now, rather than recognize the changing desires of the community for more passive green space, less development, and more affordable recreational options, City Park management is proposing to use $46 million dollars of public and private money to build brand new and expanded “PGA-quality” golf courses and a new clubhouse. In case you haven’t heard the news (wouldn’t it be nice if we had some actual newspapers in this town? ): according to Bob Becker, and coming as no surprise to anyone, the Bayou District Foundation has received the “highest point score” of the three bidders to develop and manage the new Phase I golf plan in City Park, and that now “negotiations” were being conducted. He did not state a date when the contract would actually be awarded. We can only hope that part of these negotiations involve the question of how City Park and the taxpayers will be protected when the new course ends up a financial failure, as has happened with the TPC Louisiana golf course that has to be bailed out by our tax dollars, or the Audubon Park Golf Course, which also loses hundreds of thousands of dollars a year despite being built with public funds and by an organization that receives a third of its revenues from tax dollars (see Save Audubon Park for more information). Historically, Golf was the big earner for City Park, not surprising when you consider that four golf courses consumed over half of the park. One of the biggest mysteries surrounding the pending new golf course construction and management contract remains the money: specifically, how much will the park receive, and what happens if the glowing income projections for the new course fall short, as they have done so extremely at the Audubon Park Golf Course. We thought it appropriate to outline City Park Golf’s historical income figures as a way to shed light on the numbers that any new contractor should be expected to meet or exceed. Three proposals received for the development and management of the golf courses. In January 2010, the City Park Improvement Association issued an RFP for the development and management of the golf courses that was due by Thursday, February 11, 2010. Proposals were received from Billy Caspar Golf, Honours Golf, and the Bayou District Foundation. The “City Park Golf Consolidated Income Statement” from the City park website (attached here), prepared by Economic Research Associates for the original $46 million golf master plan, shows anticipated income from various scenarios, including the current 36-hole Phase I plan. Using their numbers from the 36-hole plan at year five and above of operation (to be generous), projected at approximately $1.1 million as the average net operating income, the BDF’s proposed compensation of 40% of operating profits is $440,000/year, compared to a proposed $200,000/year for Honours Golf and a proposed $132,000/year plus unspecified “incentive fees” for Billy Caspar Golf. Although the outcome of the CPIA Board vote and the expansion of golf in City Park was never really in doubt, thanks to the outcry by concerned citizens who worked tirelessly to strip away the veil of secrecy from the CPIA planning process, the Board was forced to make a number of concessions regarding their proposed plans for golf in City Park, none of which have been mentioned in the media articles published since the meeting. An unchastened but clearly on the defensive CPIA Board was forced to back down from their consideration of a plan to lease away half of the public park under their stewardship in a no-bid transaction to a private developer for a term of 50-90 years. City Park Meeting Document distributed at the May, 26, 2010 meeting. While the loss of public park land in City Park’s version of the revised 2007 Master Plan is disturbing, it pales in comparison to the Bayou District Foundation’s “Conceptual Master Plan” for City Park, which is downright chilling. Basically, the entirety of City Park north of I-610 would become an extension of their new housing development across the bayou. The North Course would cease to exist, its land used for the BDF’s new softball and soccer complexes, the Police Stables are no more, and the Couturie Forest is shrunken and surrounded by golf courses.How inconvenient that so many critics, lowly New Orleans residents all, have interfered with their plans to take over all of this “underutilized” public property for their private development concerns. Reinventing Public Housing: Is the Atlanta Model Right for Your City? Audubon Golf Course: Lessons for City Park? Among the factors driving the deal is a clause in an old contract that could allow the 250-acre site to revert to the private donors of the land unless the course is maintained by professional golf tournament operators. “Due diligence”?! Golf and money figures just never add up. This is basically the same revenues as the old courses pre-Katrina, higher expenses as would be expected, but not a whole lot of improvement in net income to show for it all. At year 5, there is an inexplicable increase in rounds played, which trigger an equally inexplicable but steadily increasing rise in revenues and net income. However, even these low income figures in year 3 are based on 56,000 rounds of golf being played at City Park, 38,000 at the old North Course and $24,000 at the new championship course! In Louisiana, the average number of rounds per course in 2007 and 2008 was under 22,000/year; even at the TPC Louisiana course, reaching 26,000 rounds in 2007 and 2008 was considered a highly successful number (From a Times-Picayune article of 4-19-09, “Going for the Green”). As with so many other aspects of life in New Orleans, Hurricane Katrina totally reconfigured the picture. City Park’s golf courses were largely shattered. Irrigation, piping, electrical and sanitation facilities were all destroyed by the floodwaters of Katrina. Out of state contractors hacked up many of the golf courses oak trees and the courses were left with large gouges and craters where heavy equipment had settled. article. One-third of those units will be for former residents of the St. Bernard Housing Development, if they qualify, under a host of new rules. An attempt to make sense of how we got to this point. To make sense of how a simple $21 million renovation of the existing golf courses in City Park morphed into a plan for a private non-profit foundation to take ownership of the public land through a 90-year lease and build a $46 million golf complex instead, one must start at the beginning, with Atlanta’s East Lake Golf Club. In 1993, developer Tom Cousins purchased the derelict East Lake Golf Club adjacent to the notorious East Lake Meadows housing project in Atlanta for $4.5 million, and invested $25 million into its renovation, with Rees Jones as the course architect. That is OK if one is actually playing the game, but not so good if one is trying to balance the books. Massive City Park Golf Course Best Use of Space? Thanks for the heads up about the new City Park golf proposal. I went online to read it, and compare it to the 2005 Master Plan it will supersede. The proposed changes to the existing Master Plan are unacceptable. There is the gorgeous “Back of” City Park to glory in: miles and miles of informally landscaped Pasture like Realms of Nature. There is the “New Dog Park”. You must in all ways conform, obey and qualify. THEN you must apply (and pay for) the “Being Allowed Into The DogPark” Permit. you actuly are meant to swipe your personal ID card in order to gain ENTRY ino the new, tiny Dog park….to be let inside of thebeautiful nine foot high wrought Iron fence, to stroll slowly along the glistening sidewalks, or sit (whose dog wishes them to merely sit?) talking to some other QUALIFIED member. — Is all of this fun for FIDO? NO pooping or peeing allowed!! Does any of this insure a Happy Dog? I think nothing about what is called The New Dog park is the least bit interested in Dogs, or dog preferences. As all Country clubs, this one’s strongest concerns are in regards to entitled humans. Keep City Park for the Public. Some of us just want to go for long walks in the outdoors without fences, without cars..on our own city”s lands. As soon as the fly settled into the poor-boy paper mess, Alfred wrapped up his lunch leavings and threw them off his porch. He never met a plant he didn’t hate. They were taking a break from murdering the trees. Last and the year before those trees had harbored nesting Hawks. Oh well. Why push buttons? Why open this sore– when the trick is to BE THE WATCHER, right? Beauty of the so melodious green to soothe the eye. Your shadeless home would burst like a bloated moose in the hot sun. yes, oh, my. Oh my. Stay in that house with the shades drawn TV noise blaring, only come out to get into your truck and go.. I’m the anomaly here, me and my ridiculous thinking. For 40 hours now the buzz of the chainsaw has torn through the trunks, and wrested life from the weary limbs. The carcass carried off in bits, the men stamping over their yesterday’s chicken bones, today’s Poor Boy sandwich refuse. I wish it were the old days and they’d sing. I wish I were back on sailboat.